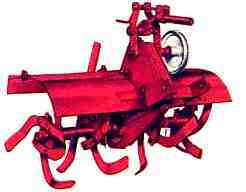 12" STANDARD ROTARY TILLER (Mfr. No. 990069) For small gardens. Specially constructed shield leaves seed bed smooth. Adjustable depth shoe for deep or shallow tilling. Low cost. Use with Simplicity 3 hp tractor. Specifications... Width of cut: 12". Fully-enclosed chain drive. Depth of tillage: 5". Bronze bearings with grease fittings. Eight tines of heavy, high carbon, heat- treated steel. Shipping weight: 62 lbs. Specifications... Tine extension set 990212 increases width to 42'. Two -step chain-enclosed drive. Precision ball and roller bearings. Shipping weight: 130 lbs. 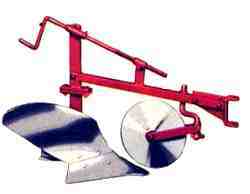 For preparing seed beds, deep cultivating and hilling. Gangs reverse to throw in or out. Leveling adjustment provided. 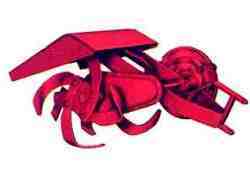 Use with all Simplicity walking tractors. 8 Disc Harrow 990206. 6 Disc Harrow 990208. Use with 990044 front counter-weight and 990046 wheel weights. Specifications ... 6 or 8 discs, 12" high, carbon steel. Bearings: oiled, hard maple. Tool bar: 36'. Shipping weight: 6--55 lbs., 8--64 lbs. Regulator permits depth changes while tractor is in motion. Swivel rolling coulter cuts trash, leaves a clean furrow. Three sizes available to meet varying soil conditions, tractor sizes. 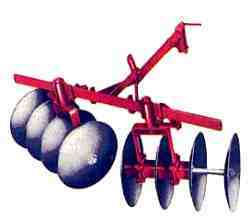 (6-1/2" Plow- 990023, 8" Plow- 990024, 10" Plow-990025) Use with 990044 front counterweight and 990046 wheel weights. Specifications... Plow share: tempered steel. Adjustable depth. Width of cut: 6-1/2'', 8" and 10". Shipping weight: 6-1/2" -- 43 lbs. ; 8'-- 45 lbs. ; 10"-- 61 lbs.